The nature of the modern knowledge economy has changed the way we perceive physical spaces. Contemporary cities are increasingly viewed not only as geographic and economic entities, but also as brands, shaped and popularized by the experience they offer to both locals and visitors. The added value, provided by a city’s brand image can help it increase its economic potential, to attract labour force and tourist interest and reap many other advantages. In other words: city landscapes are now turning into brandscapes. While larger cities around the world have already made significant steps toward building a sustainable and highly recognizable brand identity, the capitals of Southeast Europe face many challenges and opportunities on their way to discovering the importance of city branding. This article aims to take a closer look at ten SEE capitals (Tirana, Sarajevo, Sofia, Zagreb, Skopje, Chisinau, Podgorica, Bucharest, Belgrade, Ljubljana) and the way they are represented in conventional and social media. Identifying the key focal points of the media discourse on a given city is a good starting point to grasp a city’s perceived image and work towards building a more sustainable and recognizable identity. We chose six key categories for analysis and comparison and we based them on Simon Anholt’s City Branding Index – a methodology developed to measure the image and reputation of world cities, and to track how their profiles evolve. Simon Anholt is an independent policy advisor who has worked with the governments of over 40 countries worldwide and helped them develop and implement strategies for managing and improving country and city reputation. We approached these six categories* through our own analytical methods in two types of media context: conventional news articles and social media sources (blogs, Twitter and forum discussions). The analyzed period was three months (15 April – 15 July 2013) and our focus was only on English-language content, as it is currently the leading global language with a high potential for reaching large international audiences. With the accumulation of the analyzed conventional and social media content, certain patterns started to emerge and shape the image of individual countries and the region as a whole. One of the key conclusions from the comparison of the 10 capitals was that only a few of them had a highly recognizable and explicitly distinct city image. The best example in this regard would be Slovenia’s capital Ljubljana, which was often described as a very special and unique mixture of Slavic soulfulness, German industriousness and Italian dolce vita. On the other hand, most of the remaining capitals were frequently discussed en bloc, often mentioning three or four cities in the context of a large Balkan trip. This reveals an important factor for branding these cities: the challenge to create their own distinct identities, as opposed to remaining a part from the collective space – the Balkans. Alternative forms of tourism were a recurring subject in social media channels. Backpacking, hiking and cycling tours seemed to dominate blog posts and forum conversations – a sign that the SEE region is more popular among adventurers and people interested in exotic, unusual and unexplored destinations as opposed to the standard 4 or 5-star tourist experience. Many travellers from countries such as the UK and even Australia came on a cycling tour and mapped out long itineraries across the Balkan Peninsula, trying to visit as many destinations (countries and cities) as possible. This supported the above-mentioned conclusion that people were generally interested in seeing more of the region, once they have come to this part of Europe, as opposed to staying in a single place. Given SEE’s troubled history in the past decades, it came as no surprise that themes like politics, religion and ethnic tolerance often emerged in both news and social media discussions. This was particularly true for cities like Sarajevo, Tirana and Belgrade, where the wartime scars often affected visitors on a more emotional level as can be seen from the various tales on travelling blogs. Stories of either religious co-existence (Sarajevo, Tirana) or aggressive nationalism (Belgrade, Skopje) marked the vibrant social media landscape and were the topic of many blog posts and forum discussions. Protests in Sofia (actively discussed on Twitter) and Sarajevo added their influence on the way the two cities were portrayed in the media. An unexpectedly salient topic which emerged across news and blog posts on most of the analyzed capitals was the lack of tolerance towards the LGBT community. Human rights 10 Capitals – Ranking on Anholt’s Prerequisite, Place, Pulse, Potential abuse and aggression towards gay pride parades were reported in five of the 10 capitals – Sofia, Chisinau, Belgrade, Skopje and Tirana – raising important questions about the culture of tolerance and overall attitudes towards sexual minorities in the region. Reports of this controversial attitude could have negative impact on how Balkan capitals are perceived in more liberal societies. While younger visitors remained charmed and blogged about the bustling street culture of the Serbian capital and music festivals like Belgrade Calling, the city’s image suffered from serious issues like environmental pollution and bad infrastructure, covered mainly in news articles. Additionally, the blogs and on-line forums were abundant with complaints about the uncontrolled stray dogs and rip-off taxi rates. Nevertheless, the city’s friendly inhabitants, great vistas and the quickly recovering urban life after a harrowing war also left a positive impression on many visitors. In news articles Belgrade’s potential was mentioned in connection to negotiating the Stabilization and Association Agreement with the European Union. Additionally, the European Bank for Reconstruction and Development praised the pace of the structural reforms beat in Serbia. The Romanian capital was a contradicting mixture of positive and negative factors: a unique geographic location (Bucharest was often visited by travellers on their way to the Carpathian Mountains and the popular Transylvania region), poor infrastructure (people complained a lot in forum discussions and blog posts about the horrible public transport, lack of street signs and overall stressful driving conditions), friendly locals, high crime rates (according to news articles) and vibrant cultural life (discussed freely in blogs and Twitter messages). Economically, the country’s potential after entering the EU is marred by the vast ‘to do’ list of the administration; urgent action is needed to reform the public sector and state-owned companies, deliver infrastructure investments, reduce red tape and fight corruption. The capital of Moldova turned out to be a popular destination for “bargain shoppers” looking for less popular places around Europe, as well as socially responsible adventurers and Peace Corps volunteers. While it was often mentioned in blogs and news in connection to colorful events like the hot-air balloon festival and its beautiful women, Chisinau’s public image in the traditional media was damaged by reports on human trafficking and smuggling. Ultimately, despite its beautiful parks, museums and location, near beautiful country landscapes and wine producing regions, Chisinau has been portrayed as an unsafe travel destination with many issues to take care of. 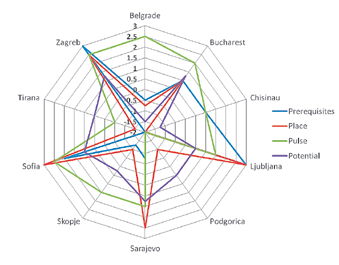 Ljubljana’s image proved remarkably consistent across all media channels. Intellectual activities, cultural events, museums, folklore festivals and music events contributed to the lively pulse of the city and spread its positive image across news articles, blog posts and forum discussions. In combination with the amazing natural scenery, highly developed infrastructure (bike-friendly alleys, free wi-fi internet connection) and excellent customer service, the Slovenian capital also impressed visitors with the friendliness of the locals. Travellers claimed on their blogs that it was the people of Ljubljana who played a big role in co-creating the city experience with their hospitality and excellent English language skills. In terms of economic potential, news articles reported that Ljubljana has a high concentration of state and local government institutions, as well as a flourishing business climate and art scene. The location of the city, close to a number of other capitals, could turn it into a bustling transportation hub if it could only improve its bad infrastructure. Blogs and forums were buzzing with people expressing their admiration for Montenegro’s nature but the capital Podgorica seemed underappreciated compared to the beauty of the countryside. The city was noted by bloggers for its climate of religious tolerance and proximity to Montenegro’s beautiful coasts. On the other hand, Podgorica was portrayed in online forum discussions as small and lacking cultural events of international importance. As could be expected, the image of the Bosnian capital both in news articles and blog posts was heavily marked by the wartime experience. Even sightseeing described by bloggers and online forum users included gruesome reminders of the horrible massacres: bullet holes on the ground are outlined with red paint – the so-called Red Roses of Sarajevo which symbolise the blood spilled during the war. Many travellers wrote in their blogs about the rich and mixed cultural heritage in Sarajevo and the impressive co-habitation of different religious groups. The friendliness of the locals, mixed with the busy cultural life (news of concerts, exhibitions, festivals and conferences were often tweeted) made the city a truly moving experience for most visitors. The good tram system and sights within walking distance were also an advantage. The news articles featuring Sarajevo suggested that the local business and economic landscape was heavily shaped by the development agency SERDA, indicated by the sheer volume of economic news featuring it. SERDA is a regional development agency appointed by the European Union. According to the numerous reports in the traditional media, the agency’s role is to encourage and strengthen the regional development through the provision of financial support, education, business infrastructure development, capacity building, information services for foreign investors, and through implementation of interregional and international projects. One word was repeated ceaselessly across news articles, blog posts, forum discussions and Twitter – the word statues. Huge, awkwardly contrasting to their surroundings statues are being built for the project Skopje 2014 which is supposed to be a grandiose commemoration of events in Ancient Macedonian history (a point Greeks are not too sure about). Many people noted the striking contrast between the dull communist city architecture and the posterity of the urban centre, sometimes using truly negative remarks such as “the Kitsch capital of Europe”, ”spending more money on ancient horses than roads and development”. The heavy pull on the public budget associated with the ambitious project has resulted in strain for some other important sectors of public spending. The city’s interesting cultural life (including a popular Museum of cartoons and the Memorial house of Mother Theresa), however, attracted positive mentions from foreign bloggers and journalists. Anti-government protests in the summer months have spurred the media interest in the Bulgarian capital. Analyses of political turmoil in the region and the rest of the world appeared frequently in the conventional media. Many bloggers also helped spread the word, mixing other stories about Sofia’s cultural life with a large number of tweets and blog posts capturing the pulse of political pro-activity. However, according to news articles the current political situation seems to have a negative impact on Bulgaria’s economic and FDI image on the international scene. Apart from politics, Sofia also attracts the attention of travellers and backpackers with its vicinity to the Vitosha mountain. The fact that it is just a few hours away from several other Balkan capitals made it a popular starting point on the route to visit the Bulgarian countryside in addition to other countries in the region. Numerous tweets and blog posts also reported on a wide range of cultural events taking place in Sofia (Sofia Design Week, A to Jazz festival, film fests, dance events, etc) revealing its dynamic social life and focusing on sports events like the Deaf Olympics 2013, held between 23 and 25 July, 2013, which attracted a lot of attention in foreign news articles. Backpackers and travelling cyclists seemed to enjoy the off -the-beat-en-path charm of Tirana and posted many positive stories and photos from the city on their blogs. However, poor infrastructure, irregular transportation and streets full of garbage were a problem for most visitors. Despite (or because of) its many issues, the city kept a strong social position and hosted numerous events and conferences related to pressing social issues (like the Conference on tolerance and non-discrimination) and offered volunteering opportunities for helping the local Roma population. Economic news articles revealed more optimistic plans for the future: the TID tower, an 85 metre business tower constructed in Tirana, has become a media symbol of the local government’s ambition to improve the business climate in the country. Like other Eastern European capitals, Tirana has set up a business park to stimulate business and entrepreneurship environment in the city. Croatia’s accession to the EU attracted a lot of fresh attention to Zagreb and many news sources and bloggers commented on the special celebrations organised in the capital for the day of the big entry. How-ever, despite its booming music festivals (a topic with huge coverage on Twitter), philharmonic concerts and beautiful Austrian-style architecture, the city was often discussed in forums only as a pleasant stop for visitors on their way to the Croatian Adriatic coast. Overshadowed by the beauty of Istria and Dalmatia, Zagreb nevertheless remained a city celebrated in travelling blogs and forums for its well maintained infrastructure, popular tram transportation and exciting open space markets. Zagreb has the image of an international trade and business centre, and is often called “the transport crossroad of Central Europe”. It enjoys the best economic climate in the country, responsible for more than half of the total financial turnover and profit of Croatia. With this diverse, yet somehow homogenic mixture of cities, the region holds many opportunities for further development and improvement in terms of image and identity. The impressions we have mapped so far form a great basis for differentiating each place and creating a consistent and well-informed brand strategy. How is each capital perceived by different audiences (media, expats, travellers etc.)? What is unique about it? What are people expecting and what do they actually experience? What impressions do they finally share online? By giving answers to all these questions we made an effort to map the media images of the SEE capitals and highlight their emerging points of untapped potential. Heat Maps – The size of the square represents the overall volume of discussion in both conventional and social media. The colour of the square represents overall sentiment, green being positive and red being negative. Darker hues of the colour signify stronger magnitude (darker green means stronger positive sentiment, and darker red means stronger negative sentiment). (*) A few words on how the categories themselves are defined: Presence – the overall reputation of a city in the eyes of locals and visitors; Place – how the physical traits of a city are perceived – climate, architecture, environment; People – the perceived general traits and attitude of residents towards visitors and potential emigrants; Prerequisites – these are the basic qualities and living amenities of a place: infrastructure, healthcare, education, transportation, social services, etc. ; Pulse – how interesting and exciting a city’s cultural and social life is and a very subjective category: Potential – the economic and educational opportunities provided by the city. Two of the categories, Place and People, were not given numerical values, because conversations consisted mainly of general impressions without focusing on tangible topics. The rest of the categories were benchmarked on a scale from -3 to +3. Theme, sentiment and volume of conversation were used for evaluating the scores.